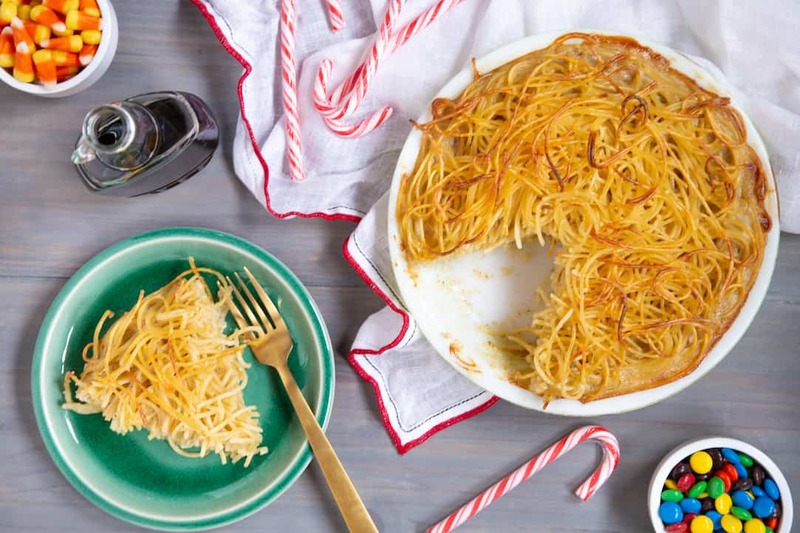 Buddy the Elf Spaghetti Pie Recipe | Good. Food. Stories. Raise your hand if you can quote at least half the lines from the movie Elf by heart. It might be a generational thing, I know. Some gravitate toward the golden oldies like White Christmas or It’s a Wonderful Life, while others prefer the Eighties classics Scrooged or National Lampoon’s Christmas Vacation. Elf is undisputably a Christmas movie, but my love of the film isn’t restricted to the holiday season. I can find a way to insert a quote or two into almost any situation. 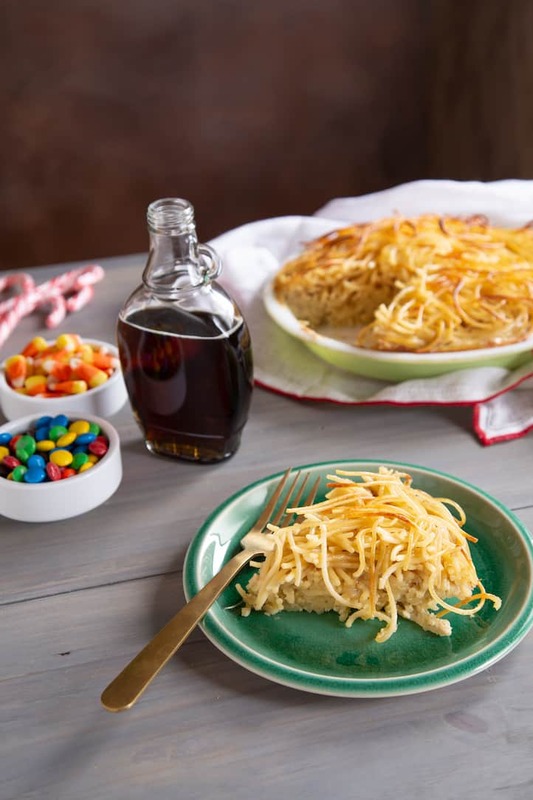 Speaking of those four food groups, this year, upon my eleventeenth viewing of the movie, I realized it would be possible to create a dish inspired by Buddy the Elf’s favorite meal: spaghetti with maple syrup. Though most spaghetti pie recipes are decidedly savory in nature, I knew I could tweak this modern Italian-American comfort food into something that would not only be edible but actually craveable too. 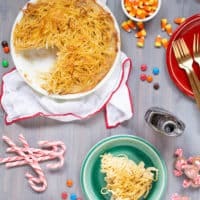 This spaghetti pie ends up as a textural cross between a kugel and a strata, but without the stomach-overloaded feeling you often get from a dense noodle casserole. With a custard base adapted from Bon Appetit‘s apple cider and maple cream tart (made this year for Thanksgiving and highly recommended), the sweet slices make an unexpected brunch side for Christmas morning. Or, if you’re a spaghetti-for-breakfast kind of person, it’s also not bad straight from the fridge the next day. I speak from experience there. 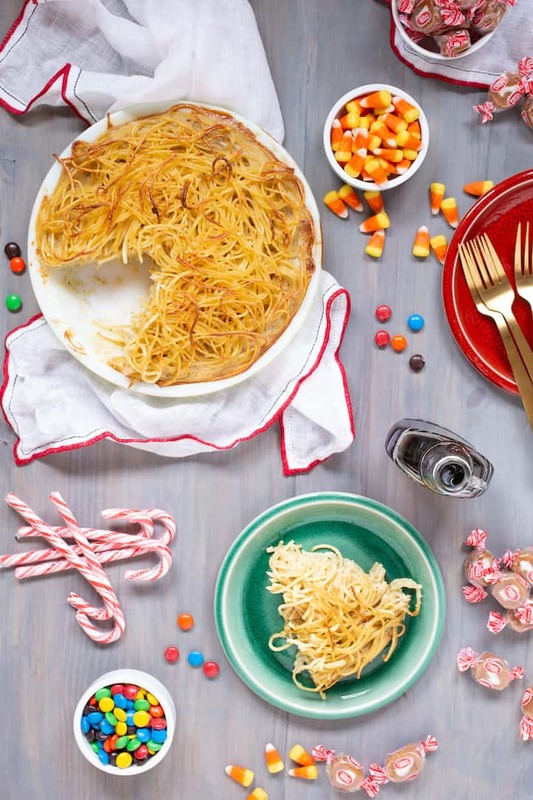 Buddy the Elf's spaghetti pie combines pasta with maple syrup for a surprisingly sweet dish. 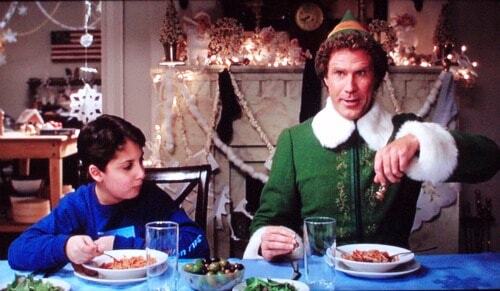 Eat with candy, candy canes, candy corns, and syrup! Bring a pot of salted water to a boil and cook the spaghetti until al dente. Drain and reserve. In a large bowl, whisk the maple syrup, cream, milk, eggs, nutmeg, allspice, and cinnamon until well blended. Spritz a 9-inch pie pan with nonstick baking spray. Add the spaghetti to the pie pan, twisting and gently pressing so it's evenly distributed. Pour the eggy custard base over the spaghetti. Bake for about 30 minutes, or until the custard has set and the top of the pie is just starting to brown. Let the pie rest for at least 10 minutes before slicing and serving.